ROTTERDAM, Netherlands — When the Netherlands beat Germany 3-0 last month the score flattered the Dutch. Ronald Koeman’s resurgent young team beat France 2-0 on Friday and this time the margin of victory flattered the French. The rampant men in orange, driven forward by the pinpoint passing of midfielder Frenkie de Jong and given a creative spark in attack by Memphis Depay’s trickery, could have scored five. Only a string of saves by France captain and goalkeeper Hugo Lloris managed to keep the score respectable for the recently crowned world champion. 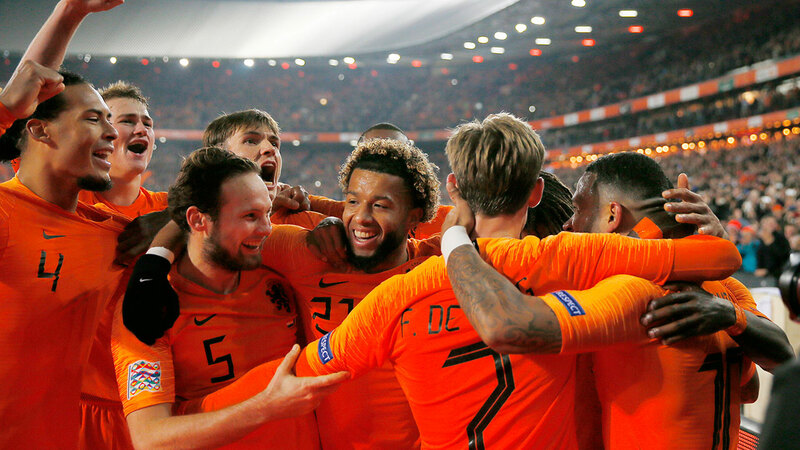 The Dutch victory relegated Germany from the top tier of the new UEFA Nations League, a second humbling this year after Germany crashed out of the World Cup at the group stage four years after winning the tournament in Brazil. Now the Netherlands, which didn’t even qualify for the last World Cup or the 2016 European Championship, needs just a draw against Germany on Monday in Gelsenkirchen to win League A Group 1. "This was a complete match at the very highest level," said Netherlands coach Ronald Koeman, who has in a matter of months turned an underachieving team into a European force to be reckoned with. In its last three matches, the Netherlands has beaten Germany 3-0, drawn with top-ranked Belgium 1-1, and outclassed France. "I want to congratulate this Dutch team," France coach Didier Deschamps said. "They played a very good match. They had a lot of quality." Midfielder Georginio Wijnaldum scored just before halftime and Memphis Depay converted an audacious stoppage-time penalty as the Dutch overran the world champion. France tried to play a waiting game, sitting back and hoping to launch speedy 19-year-old striker Kylian Mbappe on the break. But led by midfielder De Jong and centre back Virgil van Dijk, the Dutch not only dominated possession, but also shut down the World Cup star. "It is exceptional how he reads the game," Koeman said of De Jong. The result left the Dutch one point behind France in League A Group 1 ahead of the group’s final match, between the Netherlands and Germany on Monday, when Joachim Loew’s team will be playing only for pride. Wijnaldum broke the deadlock just a minute before halftime with his 10th international goal in his 52nd appearance for the Netherlands. Depay doubled the lead with a "Panenka" penalty in stoppage time, chipping the ball over Lloris to complete a memorable victory. The Netherlands must wish they could play every match at Feyenoord’s De Kuip stadium — the victory extended the Dutch run of wins there to 15. A depleted France arrived in Rotterdam after injuries sidelined Paul Pogba, Anthony Martial, Benjamin Mendy, Thomas Lemar, Lucas Hernandez and Thomas Lemar. Deschamps refused to use their absence as an excuse for his team’s lacklustre display. "We had confidence in the players we had here," he said. "We lost to a Dutch team that played very well and we did not play well." Elsewhere in the Nations League, Denmark beat Wales 2-1 in Cardiff to secure promotion from League B Group 4. Nicolai Jorgensen and Martin Braithwaite scored for the Danes before Gareth Bale hit a late consolation goal. Slovakia beat Ukraine 4-1 in League B Group 1. Ukraine had already secured promotion before the match.